In electronics world there are many varieties of analog sensors in the market that are used to measure temperature, speed, displacement, pressure etc. Analog sensors are used to produce output that are continuously changing over the time. These signals from analog sensors tend to be very small in value from a few micro-volts (uV) to several milli-volts (mV), so some form of amplification is required. For using these analog signals in microcontroller we need to convert analog signal into digital signal as the microcontroller understands and process only digital signals. So most of the microcontroller has an inbuilt important feature called ADC (Analog to Digital convertor). Our microcontroller ARM7-LPC2148 also has an ADC feature. In this tutorial we will see how to use ADC in ARM7-LPC2148 by supplying a varying voltage to an Analog pin and display it on the 16x2 LCD screen after analog to digital conversion. So let’s start by a short introduction about ADC. As said earlier ADC stands for Analog to digital conversion and it is used to convert analog values from real world into digital values like 1’s and 0’s. So what are these analog values? These are the ones that we see in our day to day life like temperature, speed, brightness etc. These parameters are measured as analog voltages by respective sensors and then these Analog values are converted into Digital values for microcontrollers. Let us assume that our ADC range is from 0V to 3.3V and we have a 10-bit ADC this means our input voltage 0-3.3 Volts will be split into 1024 levels of discrete analog values(210 = 1024). Meaning 1024 is the resolution for a 10-bit ADC, similarly for a 8-bit ADC resolution will be 512 (28) and for a 16-bit ADC resolution will be 65,536 (216). LPC2148 has the 10 bit resolution ADC. With this if the actual input voltage is 0V then the MCU’s ADC will read it as 0 and if it is 3.3V the MCU will read 1024 and if it somewhere in between like 1.65v then the MCU will read 512. We can use the below formulae to calculate the digital value that will be read by the MCU based on the Resolution of the ADC and Operating voltage. We explained ADC in detail in previous article. The LPC2148 contain two analog to digital converters. These converters are single 10-bit successive approximation analog to digital converters. While ADC0 has six channels, ADC1 has eight channels. Therefore, total number of available ADC inputs for LPC2148 is 14. It converts input voltage in range of (0 to 3.3V) only. It must not exceed 3.3V the voltage reference. As it will damage the IC and also provide uncertain values. Each converter capable of performing more than 400000 10-bit samples per second. Every analog input has a dedicated result register to reduce interrupt overhead. Burst conversion mode for single or multiple inputs. Optional conversion on transition on input pin or timer match signal. Global Start command for both converters. As told earliar, in ARM7-LPC2148 there are two channels ADC0 with 6 analog input pins & ADC1 with 8 analog input pins. So totally there are 14 pins for analog inputs. The below diagram shows the pins that are available for analog input. Since the ADC input pins are multiplexed with other GPIO pins. We need to enable them by configuring the PINSEL register to select ADC function. Registers are used in programming for using A/D conversion feature in LPC2148. Use: This register has DONE bit for A/D converter and the RESULT of the conversion is stored here. Use: This is an Interrupt Enable register. Use: This register contains the A/D value for the respective channels. 5. ADSTAT: Analog to Digital Status Register. Use: This register contains the DONE flag for respective ADC channel and also OVERRUN flag for respective ADC channel. AD0CR & AD1CR for channel 0 and channel 1 respectively. It’s a 32-Bit register. Below table indicates the bit fields for ADCR register. 1. SEL: The bits from (0 to 7) are used to select the channel for ADC conversion. One bit is allotted for each channel. For example setting the Bit-0 will make the ADC to sample AD0.1 for conversion. And setting the bit -1 will make AD0.1; similarly setting bit-7 will do the conversion for AD0.7. Important step is we have PINSEL according to the port we are using for example PINSEL0 for PORT0 in PLC2148. 2. CLCKDIV: The bits from (8 to 15) are for Clock Divisor. Here the APB clock (ARM Peripheral Bus clock) is divided by this value plus one to produce the clock required for the A/D converter, which should be less than or equal to 4.5 MHz as we are using successive approximation method in LPC2148. 3. BURST: The bit 16 is used for BURST conversion mode. Setting 1: The ADC will do the conversion for all the channels that are selected in SEL bits. Setting 0: Will disable the BURST conversion mode. 4. CLCKS: The bits from (17 to 19) three bits are used for selecting resolution and the number of clocks for A/D conversion in burst mode as it is continuous A/D conversion mode. 5. PDN: The bit 21 is for selecting Power down Mode of ADC in LPC2148. A/D is in PDN mode. 7. EDGE: The 27th bit is for EDGE is used only when the START bit contains 010-111. It starts conversion when there is CAP or MAT input you can see above table for that. AD0GDR & AD1GDR for ADC Channel 0 & ADC channel 1 respectively. It is a 32-bit register contains the RESULT of A/D conversion and also the DONE bit which indicates that A/D conversion is done. Below table indicates the bit fields for ADGDR register. 1. RESULT: These bits (6 to 15) contains the result of A/D conversion for the selected channel in the ADCR SEL register. The value is read only after the A/D conversion is completed and this is indicated by DONE bit. EXAMPLE: For a 10-Bit ADC result the value stored varies from (0 to 1023). 2. CHANNEL: These bits 24 to 26 contain the channel number for which the A/D conversion is done. The converted digital value is present in RESULT bit. 3. OVERRUN: The 30th bit for OVERRUN is used in BURST mode. When set 1 the previous converted ADC value is overwritten by the newly converted ADC value. When the register is read it clears the OVERRUN bit. 4. DONE: The 31th bit is for DONE bit. Set 1: When A/D conversion is completed. Set 0: When the register is read and ADCR written. We have seen about the important registers that are used in ADC in LPC2148. Now lets start using ADC in ARM7. The table below shows the circuit connections between LCD & ARM7-LPC2148. Learn more about using LCD with ARM 7 – LPC2148. IMPORTANT: Here we are using two voltage regulator ICs one for 5V LCD display and another 3.3V for analog input which can be varied by potentiometer. A potentiometer is used to vary the contrast of LCD display. A pot has three pins, Left pin (1) is connected to +5V and centre (2) to VEE or V0 of LCD module and right pin (3) is connected to GND. We can adjust the contrast by turning the knob. 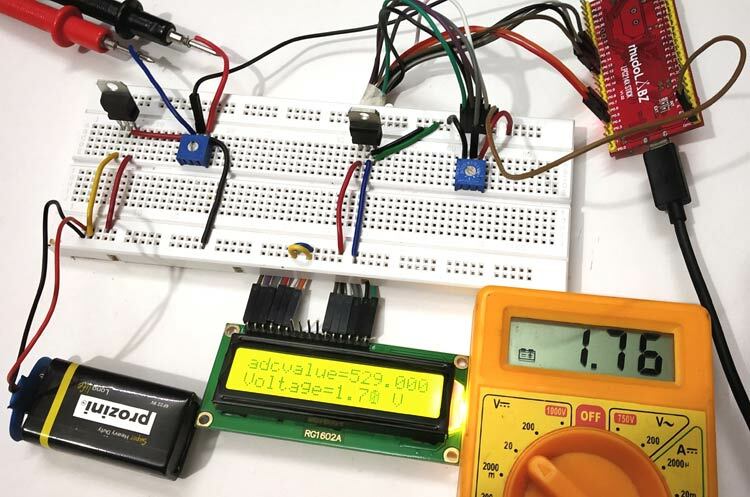 In this tutorial we convert the analog input voltage (0 to 3.3V) into digital value by using ADC in LPC2148 and display the analog voltage on LCD display (16x2). A potentiometer will be used to vary the input analog voltage. To know more about interfacing LCD with ARM7-LPC2148 4-bit mode follow this link. The complete code for using ADC with ARM 7 is given at the end of this tutorial, here we are explaining few parts of it. 1. PINSEL register is used to select the port pin of LPC2148 and the ADC function as analog input. 2. Select the clock and bit accuracy for conversion by writing value to the ADxCR (ADC control register). 3. Start the conversion by writing the value to START bits in ADxCR. Here I have written to 24th bit of AD0CR register. 4. Now we to have check the DONE bit (31th) of corresponding ADxDRy (ADC data register) as it changes from 0 to 1. So we use while loop to constantly check if conversion is done on the 31th bit of data register. 5. After done bit is set to 1, conversion is successful, next we read the result from the same ADC data register AD0DR1 and store the value in a variable. Next we use a formula to convert the digital value to voltage and store in a variable named voltage. 5. Following lines are used to display digital values (0 to 1023) after analog to digital conversion. 6. Following lines are used to display input analog voltage (0 to 3.3V) after analog to digital conversion and after step 5. 7. Now we have to display the input voltage and digital values on the LCD display. Before that we have to initialize the LCD display and use appropriate commands for sending message to display. Complete code with demonstration Video is given below.